A fantastical blend of skateboard, ATV, and battle tank, the DTV Shredder breaks new ground (literally) in the world of off-road vehicles. The DTV (standing for Dual Track Vehicle) is controlled with a patented transmission system that converts the riders movements into smooth, sweeping turns not unlike a longboard, or snowboard. A compact 196cc 13hp engine propels the rider on two rubber tank treads, with the throttle and brake controls mounted on the handle, like an ATV. 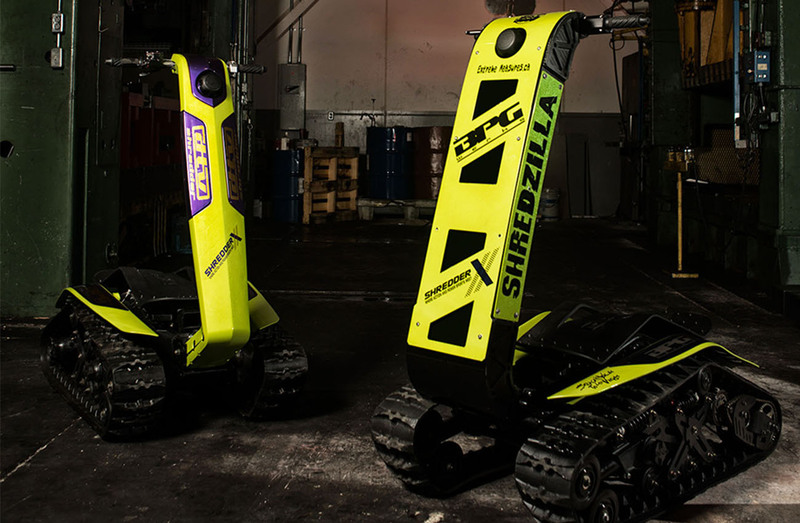 Built primarily for off-road enthusiasts and the Motocross crowd, the Shredder also has potential applications in areas such as search and resuce, military, and farming industries. While the Shredder can tear along a beach, snow, or mountain trail at up to 25mph, there is an X-Games focused prototype in the works that bumps the engine up to 48hp and can reach speeds up to 60mph. The DTV Shredder can be ordered from a BGP Werks certified dealer from $3,999.